Entrepreneurship and Small Business Management 2 Edition For courses in Entrepreneurship and Small Business Management. 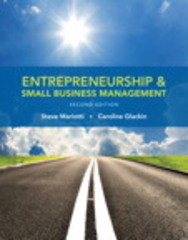 Written by award-winning experts, Steve Mariotti and Caroline Glackin, Entrepreneurship and Small Business Management presents complex economic, financial and business concepts in a manner easily understood by a variety of students. Based on a proven curriculum from the Network for Teaching Entrepreneurship (NFTE), it is organized to follow the life-cycle of an entrepreneurial venture–from concept through implementation to harvesting or replication. Filled with examples from a broad range of industries, it moves further into the entrepreneurial process–discussing the business plan and also the unique aspects of managing and growing entrepreneurial ventures and small businesses. This program will provide a better teaching and learning experience—for you and your students. Here’s how: Help Students Apply Knowledge from the Text to the Real World: Cases give students the opportunity to solve real-world challenges. Present Special Insights on Presenting and Writing a Business Plan: Go beyond formulating a business plan to include critical topics of management, marketing and operations. Guide Student’s Learning: A proven curriculum builds on the expertise of the authors and the Network for Teaching Entrepreneurship (NFTE) to teach the nuts and bolts of how to start and operate an entrepreneurial small business.